I’ve completed my first year of being a full time table tennis coach. Whoosh! The past 12 months have flown by. But what has it been like? Am I bored of table tennis yet? Did I earn enough money to pay the bills? Has my body survived the hours and hours of coaching? And what are my plans for the future? In this blog post I give an honest review of life as a table tennis coach. One of my worries when going full-time was whether there was enough people who wanted coaching. As it turns out, there has been far more demand than I can cope with. League players, complete beginners, people returning to table tennis in later life, kids playing the sport for the first time – lots of people want to learn how to play table tennis. I roughly do around 20 hours of 1-to-1 coaching per week. This usually involves a couple of evenings, weekend mornings, but also plenty of sessions during the working day. I could do more hours, but I try to balance coaching time, with creative time (writing and making videos), admin and spending quality time with the family. I had loads of aspirations about developing group sessions or doing after-school sessions in schools, but I just haven’t found the time to do this. The demand is definitely there, but it’s been too much for me to take on. As well as coaching, I have been investing lots of time into make videos for my table tennis YouTube channel. This acts as a form of promotion and it also generates an income (more of that later). Each video takes lots of effort, in terms of planning the content, filming, editing and promotion. Each month I have been publishing 3 or 4 videos. I then write 2 or 3 new articles each month for my website. Again this acts as a form of promotion and income generation. I had plans to turn these articles into a book, but I haven’t found time to do this. I’m also Chairman of Cambridge-Parkside Table Tennis club, team captain for the 1st team and coaching secretary for the Cambridge league. And more importantly than all of this, I am a father to two children (aged 7 and 3). This involves lots of playing, tidying, cooking, school drop-offs and pick ups, football classes, athletics classes and general servitude to my ever-demanding monsters. All of this has left me slightly overwhelmed at times. I try to juggle everything as best as I can, but sometimes get the feeling that there is just too much to do and not enough time to do it. This is no different from when I had a full-time office job. But I thought being a table tennis coach might be a bit more of a relaxed career. Which it probably is, but I keep saying ‘Yes’ to things, which puts more time pressure on myself. So I probably need to get better at saying ‘no’ from time to time. By turning a hobby into a full-time profession, there is always the danger of resenting the very thing you are so passionate about. But I’m not bored of table tennis yet! Hooray! There must be something wrong with me. Whilst there is certainly a degree of repetition and monotony, there is also plenty of variety. Every player brings a new challenge, whether technique, footwork, match-play or mindset. It’s constant problem solving. Trying to work out the best way to develop each player and the best way to teach different aspects of table tennis. Some coaching sessions are great. The player really wants to learn and the coaching hour goes very quickly. Other sessions can be slower and I have to work much harder to motivate the player. Much like my previous office jobs, I have good days, when I feel I bring a lot of energy to my coaching sessions. Other days, I am a bit more mentally and physically tired. But in general, when my coaching sessions go well and I feel I have coached to the best of my ability and the player I coach improves, then I get a really big buzz from this. In terms of my health, my full-time coaching career started terribly. I was hospitalised with meningitis just before I was due to start coaching full-time. This was quite frightening. Initially I had no idea what the physical impact of meningitis would be or how long it would take me to recover. Thankfully, the impact was quite mild and I was able to recover fairly quickly. But it was a wake-up call. My financial security depends upon my body. I have to be fit and healthy to be a table tennis coach, so I need to look after myself. One area I have tried to improve a lot is my diet. In the first 6 months, I was finding myself eating copious amounts of crap to give me some energy to get through all the coaching. But it didn’t seem to be working! I was constantly tired. I went to see a nutritionist to get some advice. I had to do a food diary. When the nutritionist saw what I ate, she said, in a slightly condescending way, “ah, bless, you still eat like a small child”. So with the help of a nutritionist, I have tried to move away from foods with give short spikes in energy (naff cereal, chocolate bars, junk food) to food which gives me slow releasing energy over a longer period of time. I have done much better with my breakfast routine, eating something more substantial (usually porridge or something involving eggs, nuts or fruit) and this keeps me more balanced throughout the morning. But I am still guilty of chocolate binge eating sessions. I just can’t seem to shake my obsession for Cadbury’s giant chocolate buttons. Hmmm, chocolate buttons. So nice. When I tell people what I do for a living, I often get a raised eyebrow in response. I’m sure most people think “is it possible to earn a living teaching table tennis?”. I spent many years asking myself the same question! My first year of coaching has been good. I have earned more than I expected. But my income does not come from my coaching sessions alone. I also earn money from my table tennis YouTube videos (ad revenue) and also from my table tennis website, where I earn commission on product recommendations. Some months my online earnings have surpassed my coaching earnings. When I put both income streams together, then it makes my career financially sustainable (for the time being). If I were basing my earnings on 1-to-1 coaching alone, it would be a real struggle to make ends meet. So for any aspiring table tennis coaches out there, it is entirely feasible to earn a decent income through coaching, but you probably need to develop a few different income streams. So it’s been a really good year. I’ve had the pleasure of coaching people of different ages, different nationalities and different ability levels. I have a lot of success with my YouTube channel – now over 55,000 subscribers and 6 million video views. 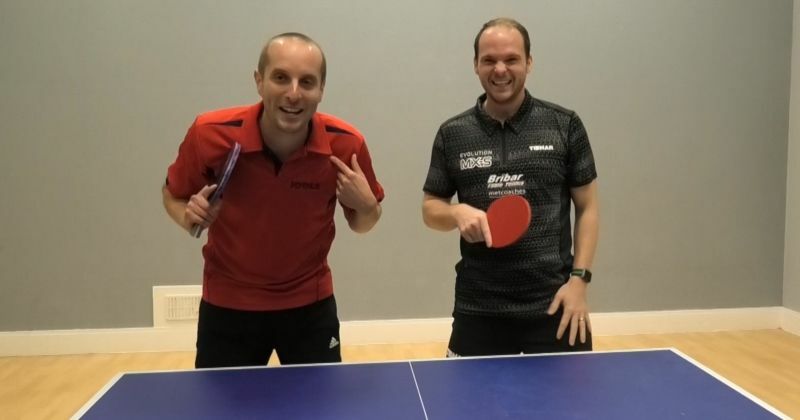 I signed a sponsorship deal with Bribar Table Tennis which has opened new opportunities, like filming with top coach Craig Bryant and England international Paul Drinkhall. That man has some serious power. If he keeps working at it, he might even be good enough to play for my local league team in Cambridge! Hopefully there will be plenty of the new opportunities in the year ahead. Already I have a trip planned to German Bundesliga table tennis club, ASV Grünwettersbach, in May. I will be taking my video camera and will be recording lots of footage and tips from the pro players and coaches to share on my YouTube channel. I will also be running my first training camp in August. It’s aimed specifically at local league table tennis players. The focus will be on the skills, technique and tactics needed to win extra points when paying local league matches. And of course, I will be investing a lot of time and energy into my 1-to-1 coaching sessions. It’s the people – their enthusiasm and keenness to learn and play table tennis, which makes the job so enjoyable to do. A big thank you to all the wonderful players I coach! Best wishes to your career. Thank you! When are you posting new videos? I think table tennis fans miss you! I am one of the foreign players you coach ;-).. just wish I lived closer to Cambridge! Lots of fun and thanks. Well done Tom, Congratulations, and keep up the great video’s, they are teriffic. Best Regards, Graham from Melbourne Australia. Gad to hear it’s going so well Tom! Thanks Ben. You were one of my inspirations for going full-time!